Mining Oil & Gas Services International (MOGSiL) Internal in-situ pipeline cleaning and coating services will keep the integrity of your oil, gas & water pipelines intact by means of a continuous internal protective epoxy coating that forms a permanent barrier to internal pipeline corrosion. The world leading MOGSiL in-situ pipe cleaning and coating process, places us in the field, at your pipeline on shore and off shore. We utilise specifically developed pipeline scrapers to mechanically and chemically prepare the internal pipeline wall along its full length prior to the unique application of corrosive resistant epoxy coating application. The development of the in-situ process stops any further corrosion from taking place. The system provides a continuous protective epoxy lining at the fraction of the cost of pipeline replacement. The MOGSiL in-situ cleaning and coating process is designed to work in steel pipeline diameters from 4 to 36 Inches and larger diameters are possible. The coating system prevents corrosion in hydrocarbon, gas, and water injection steel pipelines, and works with oil, gas, water, petroleum products, food and chemical products. It has the ability to cover pits and channel corrosion and will cover all lateral and girth welds. MOGSiL knows that every pipeline on and off shore has unique characteristics. We plan every pipeline cleaning and coating project with precision to meet the client demands and applications. The internal in-situ cleaning and coating of pipelines HALTS the damage caused by corrosion and prevents future corrosion damage. Internal pipeline corrosion is happening in today’s petrochemical industries, hydrocarbons and their by-products are causing internal corrosive damage to pipelines costing billions of Dollars per year. Internal corrosion will lead to inevitable pipeline failure. The only way to stop internal corrosion pemanently is through pipeline replacement or an internal pipeline coating sysytem. The internal protectiveepoxy coating saves your pipelines from any further internal corrosion for a fraction of total pipeline replacement cost. Oil, gas, petrochemical and water industries worldwide have found the MOGSiLinternal in-situ cleaning and coating of their pipelines versus pipeline replacement to be a proven cost saving tool, through limited project downtime and operational cost. This multi stage internal surface preparation process begins with the removal of residual hydrocarbons or product from the pipeline. Progressive pipe scrapers initially remove corroded scale. Specially developed foam brush pipe scrapers continue to remove the heavy scale within the pipeline. The multi stage cleaning processes are closely monitored and controlled by means of batch sample testing. Each batch run is sampled and analysed. 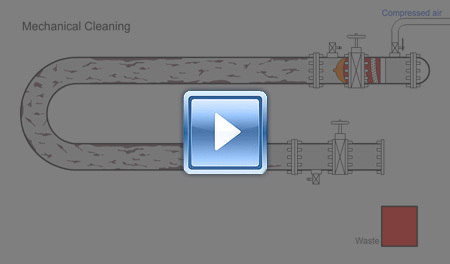 The mechanical cleaning will continue until the pre-determined internal pipe surface cleanliness is achieved. Then the chemical cleaning phase of the operation will commence. MOGSil utilise specially designed launchers and receivers attached by connector spools at the pipeline ends. Specially designed pipeline scrapers are pushed through the internal pipeline by particulate free compressed air, the oil free compressors are connected via air delivery hoses to a control manifold and then to our launchers and receivers. Inhibited acid batches are then pumped through the pipeline removing any wall corrosion and will leave the internal pipe wall surface with a near white (NACE 2) metal finish. The inhibited acid is batched between two purpose designed scrapers, ensuring the entire internal surface of the pipeline is corrosion free. Every batch is tested for solids and titrated to monitor the cleaning effectiveness. 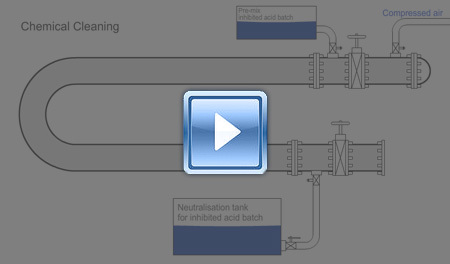 Once the inhibited acid shows no depletion in strength, the pipeline is considered clean. The pipeline is then visually examined at predetermined inspection points for verification and total cleanliness. Further inspection can be achieved through the use of a specialised un-tethered camera scraper, which provides high resolution digital video and photographs of the full forward view through the entire length of the pipeline. All process water’s that are generated are handled and disposed of according to regional governmental laws and regulations. Once a near white finish (NACE 2) has been achieved on the internal wall of the pipeline, the pipeline wall undergoes passivation to prevent any new oxidation developing. Inhibited water batches are run between two pipe scrapers to optimise the desired pH on the internal pipe wall surface. A solvent is then batched between two specially designed pipeline scrapers that removes all moisture from the internal pipeline wall surface. The internal pipeline wall is then dried further with dehydrated air, ensuring a dry and clean internal pipeline wall surface, ready for the application of the epoxy coating.